A marvel of scaled-down design, the GS Mini is a fun little acoustic cannon that has taken the world by storm. Sporting a rich, full voice that belies its compact size, the Mini is ultra-portable, yet just as comfortable to cradle in the comfort of your home, making it the ultimate modern-day parlor guitar. 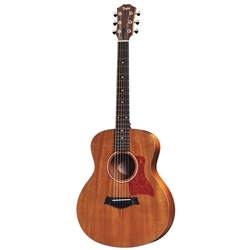 Featuring the easy-playing, patented Taylor neck, this edition of the GSMini incorporates a solid mahogany top that yields a strong, evenly balanced response for lively strumming. And with the easy-to-add ES-Go™ pickup, you'll have a viable performance tool, too.